At the turn of the last century, an English architect, Sir Edwin Lutyens, designed and had built a number of benches for use outdoors in the large formal gardens of English estates. 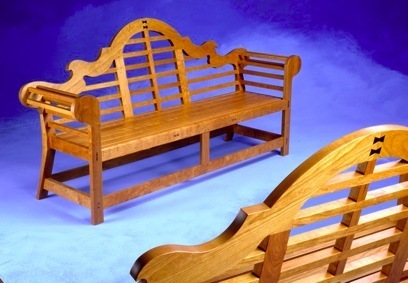 Although the original benches of this type were not constructed with fine joinery, the design was a strong one which imparts some of the spirit of the Arts and Crafts movement. In the spring of 1989 I was commissioned to redesign and build two benches in the same style, but to conform to contemporary interior aesthetic and functional design standards. The back was first redesigned to allow for a more comfortable angle of recline; instead of teak or mahogany, I made them of American cherry; and the seating space was enlarged to a full six feet in width. I used ebony for accent and functional purposes - the structural mortise and tenon joints are wedged with ebony wedges and the graceful crest rail of the back is locked together with four ebony dovetail keys. All the slats and rails of the back are joined by hand-cut mortise and tenon joints. In fact, we counted 79 hand-cut mortise and tenon joints throughout the bench.